Bohemian etcher. He was born in Prague, and died in London, His family was ruined by the capture of Prague in the Thirty Years' War, and young Hollar, who had been destined for the law, determined to become an artist. The earliest of his works that have come down to us are dated 1625 and 1626; and one of them is a copy of a "Virgin and Child" by Dürer, whose influence upon Hollar's work was always great. In 1627 he was at Frankfurt, working under Matthew Merian, an etcher and engraver; thence he passed to Straßburg, and thence, in 1633, to Cologne. It was there that he attracted the notice of the famous amateur Thomas, earl of Arundel, and with him Hollar travelled to Vienna and Prague, and finally came in 1637 to England, destined to be his home for many years. Lord Arundel left England in 1642, and Hollar passed into the service of the duke of York. With other royalist artists, notably Inigo Jones and Faithorne, he stood the long and eventful siege of Basing House; and as we have some hundred plates from his hand dated during the years 1643 and 1644 he must have turned his enforced leisure to good purpose. Taken prisoner, he escaped or was released, and joined Lord Arundel at Antwerp, and there he remained eight years, the prime of his working life, when he produced his finest plates of every kind, his noblest views, his miraculous "muffs" and "shells," and the superb portrait of the duke of York. 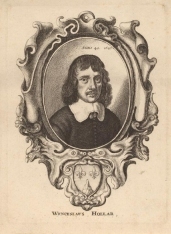 In 1652 he returned to London, and lived for a time with Faithorne the engraver near Temple Bar.During the following years were published many books which he illustrated: Ogilby's Virgil and Homer, Stapylton's Juvenal, and Dugdale's Warwickshire, St Paul's and Monasticon. After the great fire he produced some of his famous "Views of London"; and it may have been the success of these plates which induced the king to send him, in 1668, to Tangier, to draw the town and forts. During his return to England occurred the desperate and successful engagement fought by his ship the "Mary Rose," under Captain Kempthorne, against seven Algerine men-of-war,--a brilliant affair which Hollar etched for Ogilby's Africa.He lived eight years after his return, still working for the booksellers, and retaining to the end his wonderful powers; witness the large plate of Edinburgh (dated 1670), one of the greatest of his works. He died in extreme poverty, his last recorded words being a request to the bailiffs that they would not carry away the bed on which he was dying.